Sunday in Kasane started with a cooler start to the day as the sky was overcast. I was up bright and early and after breakfast where I always sit strategically so I can watch the birds in the trees surrounding the restaurant, I went off for a walk along the Chobe River. The river is teeming with activity early in the morning before the heat of the sun drives the wildlife to seek cool spots. It is also the best time of day for humans as well. It is better to walk any distance before the sun beats down on you as well. I spotted so many different kinds of birds this morning and can not positively id any of them. After finishing my walk I returned to my room, packed my suitcase to be ready for check out and made a huge mug of David’s Tea – I never leave home with out some tea bags made up in my bag – and settle down on my balcony to continue to watch the wildlife. I could get use to Sunday mornings like this. Sitting there with my feet up and a mug of my favorite tea in hand I realized that I really didn’t stop like this at home. That was the one thing I don’t miss about my beautiful house – the non-stop cleaning that it took to maintain it. With three floors there was always something to be done so when I wasn’t rushing out the door to do something, having someone over for a visit or tea, or spending time making the kitties feel special I was cleaning. The rare moments when I did sit out on my deck or up in the sun room really were rare as there was always something competing for my time and attention. I have certainly found a simpler way of life here in Botswana although I am still greeted every morning and evening by a Greek chorus of cats and a dog. I only have to clean up my kitchen after I have cooked and keep the surfaces de cluttered so Tanyla can do her job. So this morning I was actually able to stop moving for longer than 10 minutes and sit and watch the beauty and wildlife flit around me. I actually think that I am becoming serene! I can hear you all now – yelling in disbelief but trust me the metamorphosis of Cheryl continues. I am sitting in the lobby of the Mowana Safari Resort typing this as I wait to leave for the airport and the return flight to Gabs. Our flight has been delayed so I have time to relax – I actually availed myself of the world class spa services here and couldn’t be any more relaxed if I tried. I will be sorry to leave the Mowana. I have been treated like a princess here including my own personal driver, Moses who has graciously shuttled me around town yesterday and today as I went exploring and on the hunt for gifts to send home. My only complaint is that I was never truly alone in my beautiful hotel room as there was always sometime of wildlife joining me particularly in the bathroom. 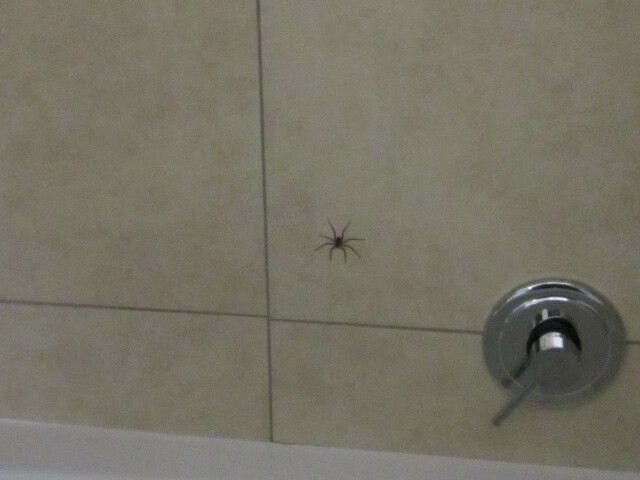 This included huge spiders (which is the only creature that gives me the creeps) and a multitude of lizards and geckos. Those can happily stay in Kasane. I will be back, we didn’t get to Vic Falls after all and I need to do that before I return to Canada. In fact, I am thinking that I need to celebrate my birthday here at the Mowana Resort because than I will know that I will be treated like a princess.